We are Fountain Hills, Arizona's first choice for residential and commercial window cleaning services. Get a free window cleaning quote from our company online now! We offer residential window cleaning services to the entire Fountain Hills metro area. We are Fountain Hills commercial window cleaning company. Ask about our maintenance programs. AZ Window Cleaners is Fountain Hills Arizona's first choice for residential and commercial window cleaning and services. Our company services the entire town of Fountain Hills. Contact AZ Window Cleaners, the foremost Valley window cleaning company, for all of your window cleaning needs. We endeavor to make first time customers repeat customers by the care in which we take in cleaning the windows of your Fountain Hills residential or commercial property. Our experienced window washing technicians have the know how to make your window cleaning project a top-rated piece of work. Your windows will sparkle in Arizona’s abundant sunshine when our workers complete your window cleaning! Rest assured, that our window cleaners follow all Arizona building codes and safety regulations. Call our staff for an estimate of your costs. We guarantee affordable prices for all Fountain Hill property owners! Residential window cleaning services in Fountain Hills, AZ. 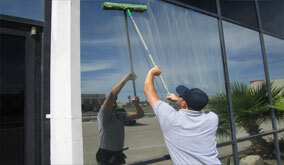 Commercial window cleaning services in Fountain Hills, AZ. When AZ Window Cleaners’ friendly window cleaning technicians arrive to begin your work order, they will inspect your windows, design the best way to complete your individual window cleaning and then confirm the agreed upon cost of the project. AZ Window Cleaners even wear protective boot covers to make certain they leave no trace of their presence when they have completed the job. But that is not the best reason to call AZ Window Cleaners! The best reason to call is because you’ll appreciate our 48-hour rain warranty. AZ Window Cleaners 48-hour warranty, allows our technicians to return to your Fountain Hills property, home or business, and retouch any windows damaged by monsoon storms (the mixture of dirt and rain) on your newly cleaned windows. Please note that regular rain will not mar recently completed window cleanings. So call AZ Window Cleaners today to discuss your window washing needs and to obtain a free estimate of the cost to make your property dazzle again! Call today to schedule your free on-site window cleaning quote for your Fountain Hills, Arizona property! We are Fountain Hills, Arizona's first choice for residential window cleaning services. Call today for a quote! 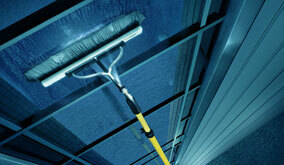 We offer services that most window cleaning companies in Fountain Hills neglect. Learn more below.